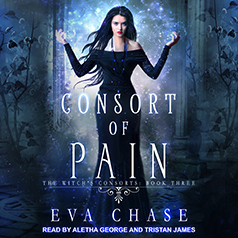 Eva Chase presents the third book in her Witch's Consorts series. Contains mature themes. I've overcome the odds to claim my magic and the five men I'm not supposed to love. Then, just when I think we've finally found peace, our lives are turned upside down by a life-shattering threat. If our enemies succeed, we'll be dead by tomorrow. But they've never fought Rose Hallowell before. Even I haven't discovered the limits of my powers yet. I just wish I could be sure that my magic will be enough. I can't summon it alone, and the more energy my consorts offer me, the more pain I could cause them. Can I find new allies to help us win the day—or will we be betrayed all over again?